In our previous blog post, we explained how your first step should be a Minimal Upgrade with the goal of getting onto a supported version of TM1. The good news is that a Minimal Upgrade is relatively uncomplicated. For the record, even if you are on TM1 10.2.0, QueBIT’s strong recommendation is to upgrade directly to Planning Analytics. You do not need to upgrade to TM1 10.2.2 as an interim step. This is a simple picture of what you likely have today with TM1. The details may vary: you may use an RDP (Remote Desktop Protocol) tool like Citrix if your data center is far away because Perspectives and Architect do not work well over a wide area network or you may only give your end users access to TM1 Web to avoid this issue. You probably also have separate development and production servers. Regardless of what you have, I hope we can agree that this image captures the essence of how TM1’s components interact. If you take the simplest Minimal Upgrade path, which is to go to Planning Analytics Local (PA Local) keeping your on-premise license and just continuing to use what you use today, your picture will look exactly the same as this one AFTER you upgrade to Planning Analytics. NEVER heard of ILMT? It stands for IBM Licensing and Monitoring Tool. It is a FREE download from IBM. If you have a PVU based on-premise license and are deploying TM1 or PA Local on a Virtual Machine, IBM requires you to install and configure ILMT to monitor your license compliance. Please contact QueBIT at upgrade@quebit.com if you have questions. Failure to install and configure this software may result in large fines if you are ever subject to an IBM audit. If you have been paying your annual support renewal for TM1 to IBM each year, you are automatically entitled to perform the Minimal Upgrade to IBM Planning Analytics Local without incurring any additional software license costs. Furthermore, you are entitled to roll out the PAx add-in to all your users, if you wish, also without incurring any additional software license costs – for TM1. 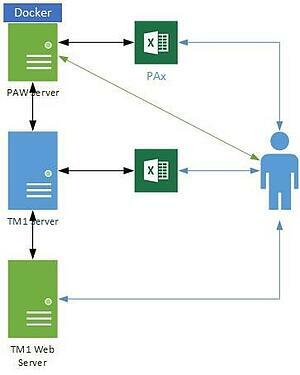 If you choose to deploy PAx, you will need to add a computer on which to run the PAW server software which is necessary to deploy the new PAx Excel add-in to your users. This addition is indicated in the boxed section at the top of the image. 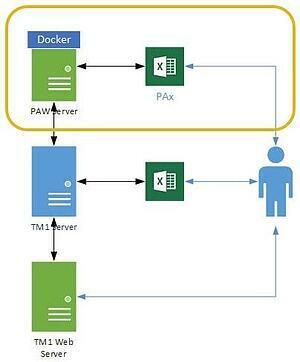 The PAW Server software uses another piece of software called Docker. Now it gets interesting: depending on the platform (Linux, Windows, etc.) you pick, you may only get the free version of Docker. In this case, QueBIT recommends you invest in the Enterprise version of Docker. Enterprise Docker is relatively inexpensive and you may find that your IT department already owns it. The key thing to note before setting up a PAW Server is to make sure you ask questions about the operating system platform (Linux, Windows, etc.) and Docker versions. Unlike PAx, you do NOT automatically get a license from IBM to deploy PAW to all your users as part of your regular renewal. You will need to purchase a “PAW Upgrade” from IBM in order to do this (more on this below). There is one exception, and that is if your current on-premises license is a TM1 Enterprise or Cognos Express license. If you have one of these two license types, your Modeler users (Modeler is the administrative and developer license type) are entitled to use PAW without purchasing a PAW upgrade. The rationale is that this gives TM1 administrators the opportunity to explore PAW’s capabilities before making the bigger investment on behalf of all end users. If your current on-premises license type is the “PM Advanced” license type, this exception for Modelers does not apply. Contact QueBIT at upgrade@quebit.com if you have questions! From a system architecture point of view, things are simpler. Once the PAW server is in place to support PAx, you have all the technology you need to deploy PAW. This is shown in the diagonal line from the user to the PAW Server in the image. IBM has stated that eventually TM1 Architect and Perspectives will go away, and the future modeling and administrative tools will all be within PAW. QueBIT recommends you take advantage of the Minimal Upgrade approach NOW to get on a supported release, but remember, you are only buying time to plan your move to PAW. While nothing has been announced, our estimate is that Architect and Perspectives will be around for at most 2-4 more years. IBM is making it easy and inexpensive for customers to move to PAW right now: see the Current Offers section at the end of this Blog Post for more on this topic. In our previous blog post on the Minimal Upgrade, we addressed the possibility that some customers may take the PA Upgrade opportunity to make the jump to the IBM Cloud. Note, if you own on-premises TM1 or PA Local licenses, you are welcome to put your TM1 Server anywhere you like, including in the Amazon (AWS) or Microsoft (Azure) clouds, or on any Public/Private/Hybrid Cloud infrastructure that your company prefers. If you no longer wish to administer or maintain your own TM1 server, you have the option of reaching out to QueBIT to make arrangements for you, in conjunction with a Managed Services agreement! We bring this up because the IBM Cloud is special in the Planning Analytics context. IBM provisions all server hardware, and takes care of server installations and upgrades (so you do not need to provision a “box”). Turnaround time for provisioning new environments, is much quicker than the typical IT department. Per user per month subscription pricing, with surge pricing for especially busy months. This takes away the worry of whether you have purchased enough licenses for your user base, and gives you flexibility if you have very occasional users and contributors to the plan. You are no longer subject to the requirement to install ILMT license monitoring software to prove compliance with licensing terms in case of an audit (a huge benefit). Configuration of direct ODBC connections to data sources, which involves provisioning a machine on which to run the IBM Secure Gateway software. 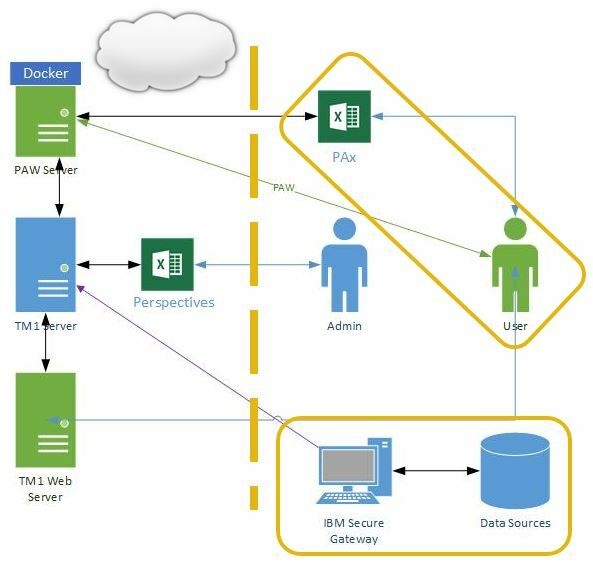 Note that using IBM Secure Gateway is also an option if you are using an on-premises license, but have placed your TM1 Server in the Public cloud or a remote data center. Contact upgrade@quebit.com for more information. Configuration of security authentication, including single sign on (SSO). Planning to transition any end users who need an Excel client from Perspectives to PAx. 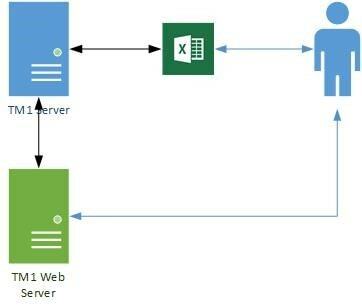 If you do not have end users who expect or need access to an Excel client, you do not have to deploy PAx. If you do, you will need to download and install PAx and should expect that training will be needed. The PAx user experience is superior to, but quite different from, Perspectives and Architect. Everything to the LEFT of the thick vertical dashed line is in the IBM Cloud, and is provisioned and configured by IBM. If you decide to move to IBM Cloud, you will be entering into a brand-new software license agreement with IBM. Please contact QueBIT at upgrade@quebit.com for additional information or review the Current Offers section below.